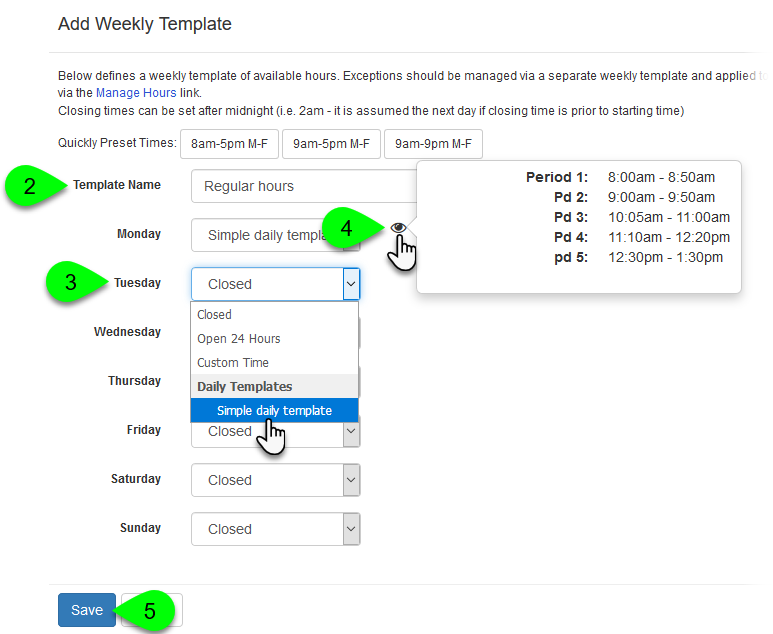 Weekly hours templates allow you to set an opening and closing time for each day of the week. However, what if your location has gaps in availability between your opening and closing times? This is where daily hours templates can come in handy. And, let's say these times alternate on different days of the week, so you may have one schedule on Mondays, Wednesdays, and Fridays, then another on Tuesdays and Thursdays. With daily hours templates, you can create multiple templates to do just that! You can also make special templates for exam days, days with special events -- really, anything you need. Once you have your daily templates created, you would then apply them to your weekly hours templates. How do I enable daily templates? Go to Admin > Equipment & Spaces > Manage Hours Templates. Under Daily Templates, click on the Add New Daily Template button. In the Add Daily Template window, give your new template a name. 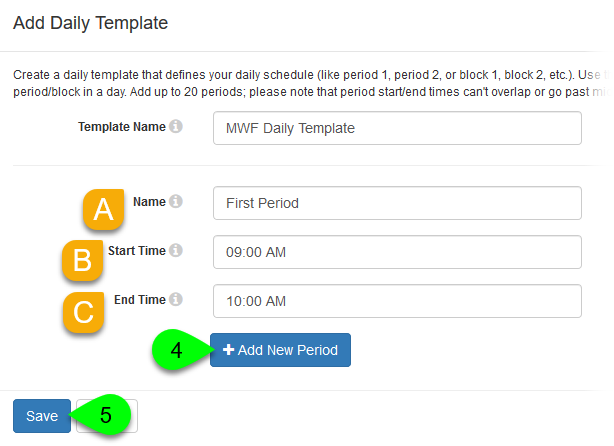 Click on the Add New Period button to add your first period to the template. Give the new period a name (e.g. First Period, Study Hall, etc.). Click inside the Start Time field and use the date pickers to select when the period begins. Click inside the End Time field and use the date pickers to select when the period ends. Repeat Step 3 to add more periods to your daily template. When finished adding periods, click the Save button. To change a template, click on the its Edit () icon in the Action column. 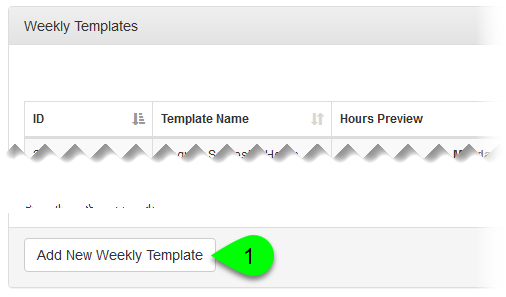 Under Weekly Templates, click on the Add New Weekly Template button. Give your template a name. For each day of the week, select the hours or daily template to use. To use a daily template on a particular day, select it from the dropdown. You can still choose the Custom Time, Open 24 Hours, and Closed options, as well. When you've selected a daily template on a particular day, hover over the Preview () icon to see that template's periods. 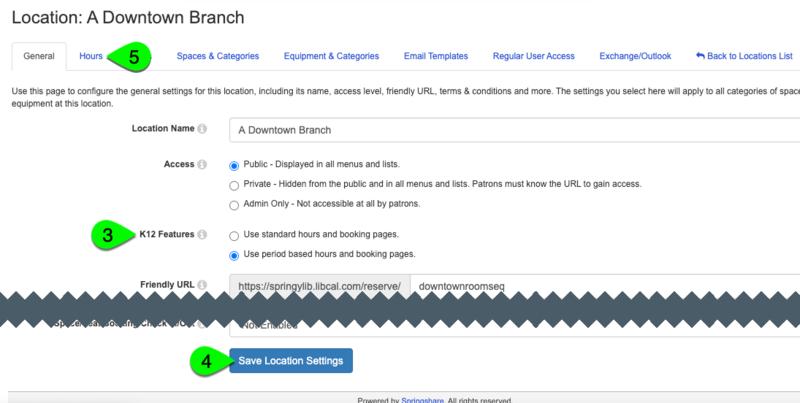 The last step in the process is to enable the K12 Features for your location(s). This will allow you to use the daily hours templates with your locations and its categories, spaces, and items. Go to Admin > Equipment & Spaces. Under the Manage Locations tab, click on the location's Edit () icon in the Actions column. 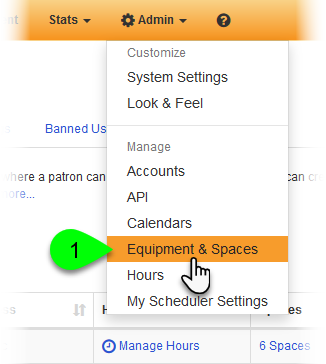 Under the General tab, set the K12 Features option to "Use period based hours and booking pages". Click the Save Location Settings button at the bottom of the page. Once that's enabled, you will be able to use the weekly hours templates containing your daily templates. Can a category or space / item have different hours from the rest of its location?